Sometimes artists record albums to make a cohesive, singular statement. Sometimes, the LP is simply a collection of what the writer has laying around that he hasn’t used yet, but, for the most part, when an album is released, unless it is a ‘concept album’ like The Who’s ‘Quadrophenia’ or Pink Floyd’s ‘The Wall’, the artist never intends to perform the entire record in front of a live audience. In early 2016, Bruce Springsteen embarked on ‘The River Tour’ in which he played his entire two-record set from start to finish. By the time the second leg of the tour finished, that idea was abandoned, simply because the pacing of a record does not always make for great pacing in a live setting. 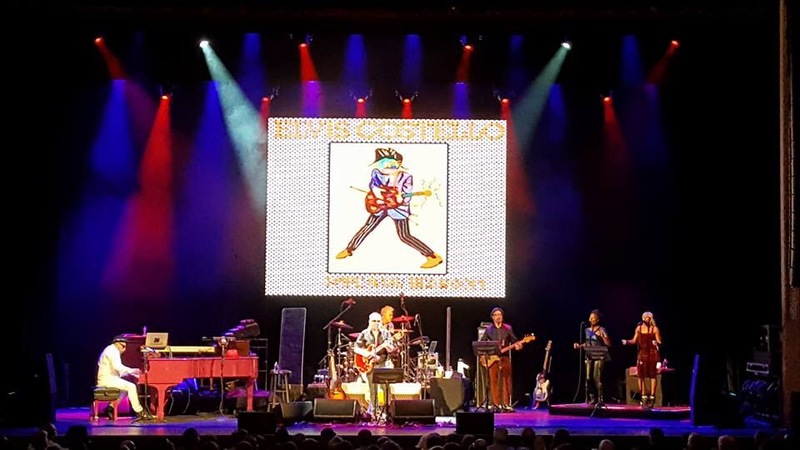 Which brings us to Elvis Costello’s latest US tour, which stopped in DC last night; entitled ‘Imperial Bedroom and other Chambers’, Elvis and his band The Imposters promised to play the entire ‘Imperial Bedroom’ album, along with other songs from all eras of his career. And, the first thing Elvis got right that The Boss did not is, he chose not to play the songs in running order, which would have made for a very strange live show. Knowing before the show began that I would hear ‘You Little Fool’ and ‘Man Out of Time’, two of my all-time favorite Costello songs, I was extremely excited to see what the evening would bring as my friend Dana and I made our way inside the beautiful Warner Theatre. Elvis kicked things off with a very deep cut, and a song not from ‘Imperial Bedroom’. Instead he started the evening with ‘Town Where Time Stood Still’ from the ‘Punch the Clock’ album. I admit, it was one I did not immediately recognize until the chorus showed up, and even then, the initial sound mix made the lyrics a bit hard to understand. If the audience wasn’t really sure what to make of the opener, that was soon corrected when drummer extraordinaire Pete Thomas launched into ‘Lipstick Vogue’, played at breakneck speed. Before launching into the first ‘Imperial Bedroom’ selection of the night, ‘The Loved Ones’ Elvis asked the crowd ‘Are we sick of this yet?’ The audience seemed perplexed, as the show was just getting started. ‘I don’t mean the show, you know what I mean! Are we sick of this yet? !’ he clarified, to which the crowd roared their approval. Almost every track on the album demonstrates Costello’s lyrical acumen, and if the public at large weren’t ready to follow him, he didn’t care. Thankfully the record has been repackaged and rereleased several times over the last twenty years, allowing fans to rediscover and appreciate it, and I think today the album, rightfully so, is considered one of the best in Elvis’ 40+ year career. Playing all of the songs live was no small feat, but for those lucky 1400 fans in attendance, it made for a very memorable evening. Mid-set, hearing, in this order ‘Pills and Soap’ (again, a song that is an acquired taste), ‘Hand In Hand’, ‘Hi Fidelity’ and ‘You Little Fool’ was the portion of the show that seemed to be directed right at me! Hearing those songs all in a row, almost without even a break to differentiate where one ended and the next began, was a wonderful moment for this longtime fan. While the set mostly consisted of material originally performed by Elvis & The Attractions, along with one of his collaborations with Burt Bacharach, the evening wasn’t completely about nostalgia. Costello is working on a musical adaptation of the 1957 film ‘A Face in the Crowd’ which starred Andy Griffith as a man who rises from the gutter to the halls of power. (If you’ve never seen the film, I highly recommend it). Elvis showcased three songs from the production, which definitely gave the proceedings a political undertone. A shout out to the mad musical genius that is piano/keyboard player Steve Nieve. His showcase piece of the evening was a charged and tense rendition of “Shot With His Own Gun”. Thomas, Nieve and bass player Davey Faragher (the “new guy” who’s been with the others for about fifteen years) were on point throughout the night, helping to keep things moving. The second to last song of the night was the crowd pleaser ‘Pump It Up’ which had everyone dancing, regardless of their politics and then he closed the night with a song written by Nick Lowe and recorded by Elvis in 1978. The song of course was ‘(What’s So Funny ‘bout) Peace Love & Understanding’ and, I cannot think of a more appropriate song (or question for that matter) given the current climate. It’s quite a feat when a song originally written in 1974 is now, forty-two years later, even more frighteningly relevant than I think its author or the evening’s performer could have ever possibly imagined. What’s so funny ’bout peace, love, and understanding? Thanks as always to Dana for attending this show with me, and thank you very much for reading. It’s been a while since I posted on the blog, so I thought I would take a moment to talk about this past weekend’s activities and look forward to what promises to be a phenomenal show this Saturday at The National. Let’s start with last Saturday [04.17]: VCU Theatre’s production of ‘The Who’s Tommy’ at The Raymond Hodges Theatre. You’re either a fan of The Who, or your not. No production of Tommy will persuade you to like The Who, nor will the ‘normal’ Who fans seek out other musical productions after seeing ‘Tommy.’ People go see this show to hear the songs live, hoping they sound somewhat similar to the double-album they already know. It’s hard to believe that this ‘rock opera’ is now over forty years of age. Most of it has worn well, and this production brought home the point that, as a story, ‘Tommy’ is still as sick, as twisted and as sadistic as it was in 1969. Moments still make me cringe [the whole ‘Uncle Ernie/Cousin Kevin bit] but, this is a good thing. It’s a heavy play that doesn’t flinch from subject matter that was very taboo back then and doesn’t get discussed often now. And, don’t forget, at its core, it rocks. This production, done ‘in the round’ is very fluid and never slows down. The performers that stood out to me were Eric Stallings as the teen-aged Tommy, Malorie Mackey as the ever-optimistic believer Sally Simpson, and young Cooper Timberline as the young Tommy. Stallings and Timberline did a masterful job of remaining in character, in the required catatonic state of Tommy, while being poked, prodded, carried and pushed. It really was a wonder to watch these two actors embody this singular character. Lastly, the band is top-notch. Yes, there was only one foursome that had the bombast of The Who, but these local musicians do a great job staying true to the soundtrack, even playing ‘The Underture’ in Act One, which I fully expected to see cut from the show. The show is playing this weekend and closes Sunday. Go to Theatre VCU for details. Tickets are $25 for the public with discounts for VCU students, alumni and staff. If you’re a fan of The Who, go support local theatre and check out this ambitious production. Just a brief note about Sunday’s ACM awards, since I had some new readers ask why I hadn’t written anything about it on Monday. Taylor Swift may not have walked away with any awards this time [which, even though I am a big fan, I kind of expected, seeing as how the album has been out for a long time], but she had one of the most memorable performances of the evening that should, once and for all put to an end the notion that she can’t sing live. This was an appearance where her voice sounded as strong as it did a month ago when I saw her live show in Charlottesville. If ya missed it, here it is, via the wonder that is YouTube. Congrats to Lady Antebellum and Miranda Lambert on their wins and performances. Miranda’s performance of ‘The House That Built Me’ was a great showcase for her, showing that she can sing the quiet song, not always having to be the ‘Crazy Ex-Girlfriend’. And, of course, my dream setlist isn’t complete without the inclusion of I Hope You’re Happy Now. I will be happy with whatever is played. But if any one of the above songs is heard, I’ll be ecstatic. Thanks again to The National for really putting Richmond on the music scene map for the first time in a very long time. It’s so nice to have a club that bands want to play! 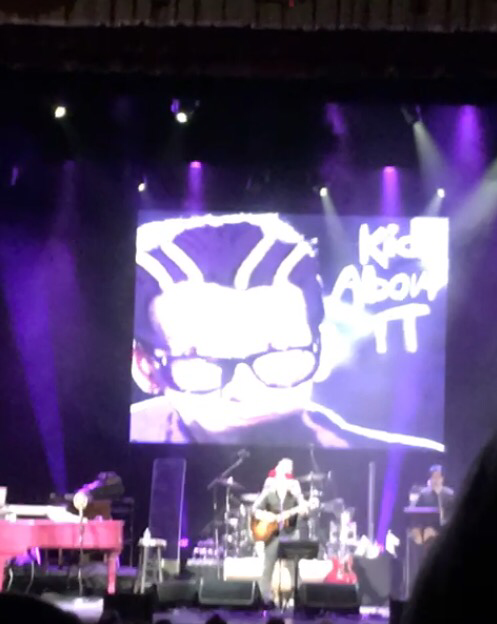 Full review of Elvis Costello at The National will be posted by Monday night. If you have tickets to that show, see you there. If you don’t, go see Tommy at VCU. More shows and reviews coming soon…including Jonathan Coulton at The Hat Factory May 13, Carrie Underwood this Tuesday at the Coliseum, and a full recap of the madness that is NASCAR on May First.